I have observed the issue shared by you and request you to please share the test account to verify the issue on our end. Ideally, the MessageID must come for every message retrieved. I have attached the sample application and output obtained for your reference. If it were an API issue then issue must be reproduced in console based application. I request you to please verify the things and configurations on your end. Is there some way that you can test it in IIS the code that i supply? 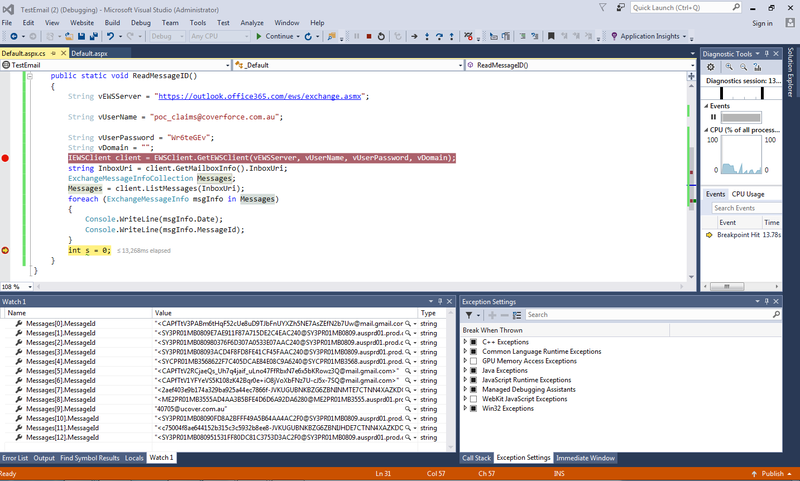 You may please share a working Visual Studio project with us reproducing the issue but it is not an API issue as if it were an API issue the console application would have reproduced the same issue. I have verified the same in Web based application as well using IIS express. It fetched the the MessageID correctly too. For your kind reference, I have attached the snapshot of sample and sample project too. I request you to please provide us a sample solution application that is reproducing issue on your end. We will try that on our end to see if we can reproduce issue using your application or not. So far in both applications (Console and Web based) that we have shared with you as well, we have not been able to reproduce the issue. I have observed the information shared by you and have been able to observe the issue on my end. An issue with ID EMAILNET-39456 has been created in our issue tracking system to further investigate and resolve the issue. This thread has been linked with the issue so that you may be notified once the issue will be fixed. Its good to know that you have found solution. Please share feedback with us if there is still an issue.